Full size is approx. 4.25"W x 0.75"H x 6.25"D.
Spicing up your desk area is a must! Do it in a classy way with this beautiful red mahogany colored wooden sticky note holder and nameplate. It will be sure to give off a high class professional vibe to anyone who steps into your office. This sticky note holder is a beautiful dark cherry color that will rock your world. The holder itself is about 4.25"W x 0.75"H x 6.25"D. The indention for your sticky notes has a velvety bottom and holds 3" x 3" sticky notes. The nameplate sits next to your sticky note indention and is easily personalized through our design center. Have fun creating a professional or fun nameplate! Pick a cute subtle pattern and add a dashing font for your name. We have plenty of choices when it comes to personalization. If you need any help using our design center just give us a call. 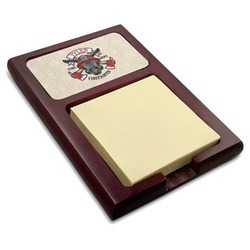 Create a matching desk set with our red mahogany colored nameplate and business card holder. Go into our Office section where you'll find a fun selection of accessories. We have leather desk weights, sticky note cubes, leather valet trays, pencil holders, and more.